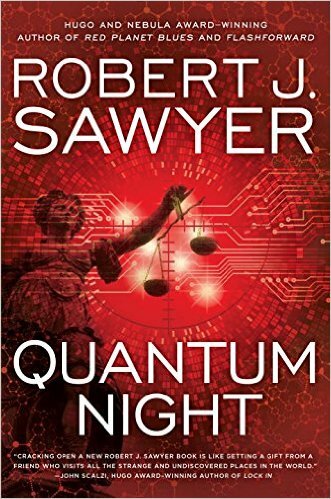 Robert Sawyer is a stalwart of the science fiction world. A writer interested as much in ideas as he is in the usual sci-fi mechanics. He is probably best known for the book that launched a short-lived post-Lost TV series Flashforward. In Flashforward, everyone in the world experiences a loss of consciousness that gives them a glimpse of the future. The book dealt with questions of predestination and free will. More recently, Sawyer gave us the WWW trilogy in which the World Wide Web develops consciousness. So it is no surprise that Quantum Night relies so heavily on theories of the conscious mind and how it works. The main character of Quantum Night, Jim Marchuk, is an expert in determining whether someone is a psychopath. But when put on the stand to defend his technique, Marchuk is torn down, not because his technique is flawed but because he fails to remember a crucial period of his life. It turns out that Marchuk has no memory of a six month period of his life from twenty years earlier. Marchuk’s exploration of that time leads him to a former girlfriend who he did not previously remember having and a secret experiment on human consciousness which he took part in. Coincidentally, his former girlfriend also works in the field of consciousness, exploring a theory that different forms of consciousness are the result of different quantum states in the brain. If this all sounds a bit heavy and philosophical then that is probably because it is. Much of the book is taken up by people debating different models and types of consciousness and the ethics of changing people’s state of consciousness. And while this is clearly well researched, it does not make for much of a riveting plot. The plot, such as it is, revolves around rising global tensions – riots, violence against immigrants and refugees and global posturing between super powers. The resolution of this is completely over the top but at least in keeping with the theories that Sawyer is interested in investigating. In the end, though, the whole effort feels like a massive thought experiment rather than a novel.